Chinar Farooqui is a textile and clothing designer based in Japur, Rajasthan, India. 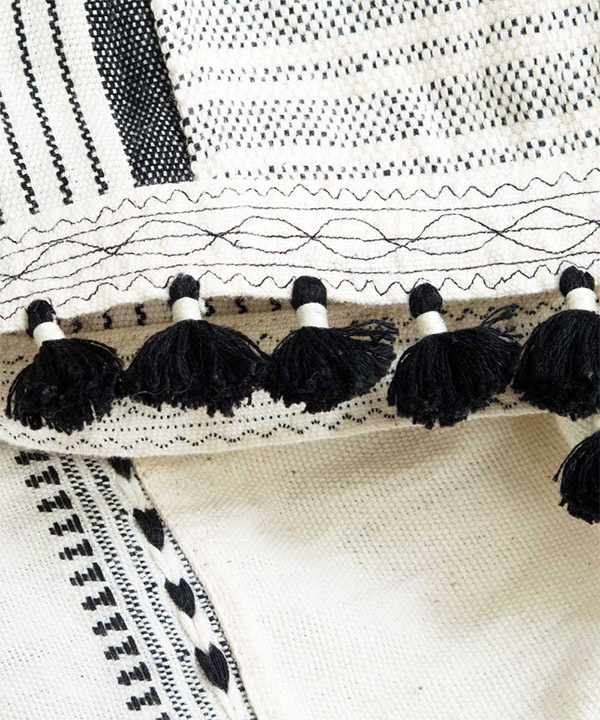 Her passion lies in studying traditional textiles and dress, and the stories behind them. One can often find her spending hours in museums studying the folk garment collections. She finds a lot of inspiration from her travels as well, observing local lifestyles of people. Founded in 2009, her label ‘Injiri‘ is the outcome of her interests in traditional textiles and garments. I am pleased to share my interview with textile designer Chinar Farooqui with you today in honor of her two new collections ‘Ahir’ and ‘Recycle’, for her innovative home and fashion label Injiri. Hand-woven design from China Farooqui’s label ‘Injiri’. Jacquin: What is inspiring you creatively at the moment? Chinar: I am most inspired by vintage aesthetics, specifically in the way traditional people use textiles and the way they sew their garments. I am drawn a lot to Moroccan and Turkish textiles at the moment, as well. The inspiration for most of my garments comes from the local dressing styles of rural India and other folk cultures from around the word. It is the simplest work clothes of peasants, farmers and common man that inspires me most. Original textile and weaving design from Chinar Farooqui’s Injiri label. 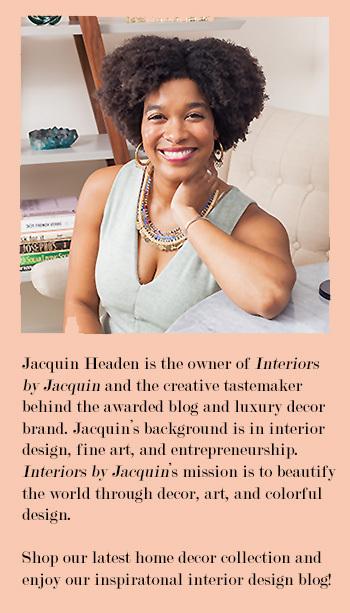 Jacquin: How did you develop your new collections? I would love to learn about the process. Chinar: I design the textiles first with impressions I have in mind – these are usually visuals impressions that are carried with me from my travels. I do a set of drawings and illustrations as I develop each collection. I then sit with the weavers to interpret the visuals and drawings. I use their traditional textiles as references for techniques that I’d like to use from their existing vocabulary. This helps tremendously – as in India traditional textile techniques are region specific (like most places around the world). I develop all the patterns in close association with the weavers who then replicate it for production. 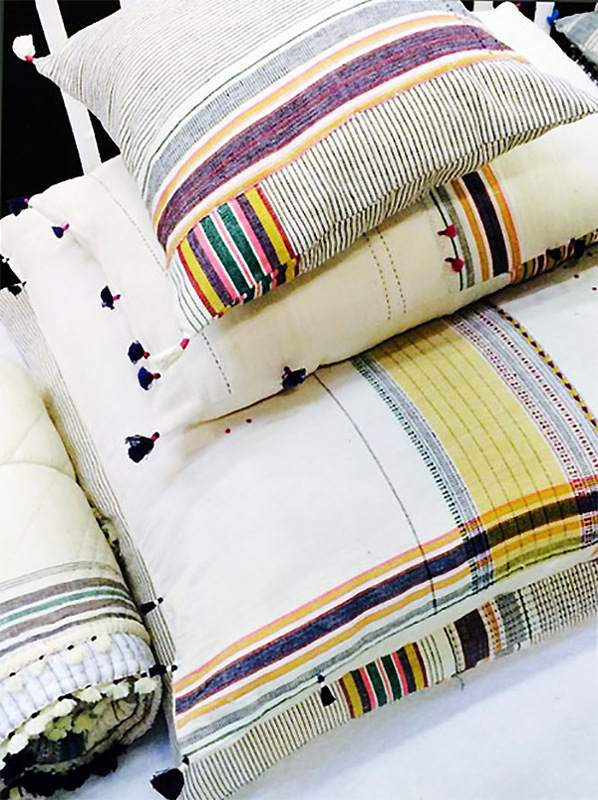 Hand-woven pillows from Injiri’s new “Ahir” collection. Injiri’s new collection ‘Ahir’ (above) features bold and bright colors. Ahir is the namesake of the Ahir caste, and ethnic group migrated into India from Central Asia during the early Christian era. For generations they have been farmers, herders, and warriors. The elaborate costumes of the Ahir women have infused bright colors into the new Injiri home collections. 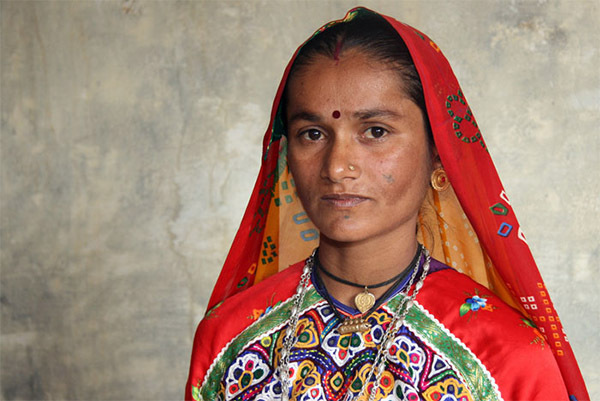 An Ahir woman dressed in traditional garb, infused with colors, shapes and patterns. Jacquin: I had the opportunity to live in Jaipur (India) for a few months and I really enjoyed it. It’s such a beautiful and traditional city. 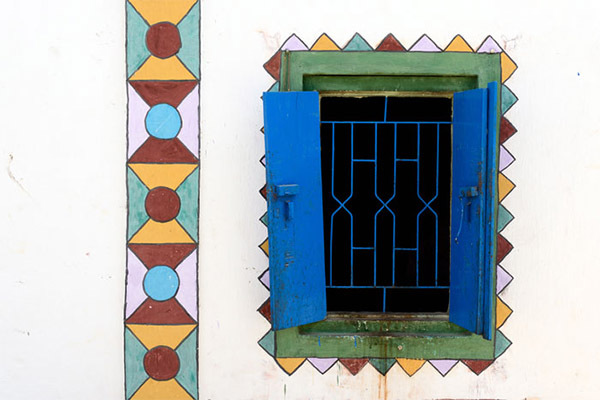 How does life in Jaipur, Rajasthan influence you as an artist? Jaipur. I generally like the feel of living in Jaipur, which can be a very inspirational place. Photo taken in the streets of Gujurat, India, where many Ahir people dwell. 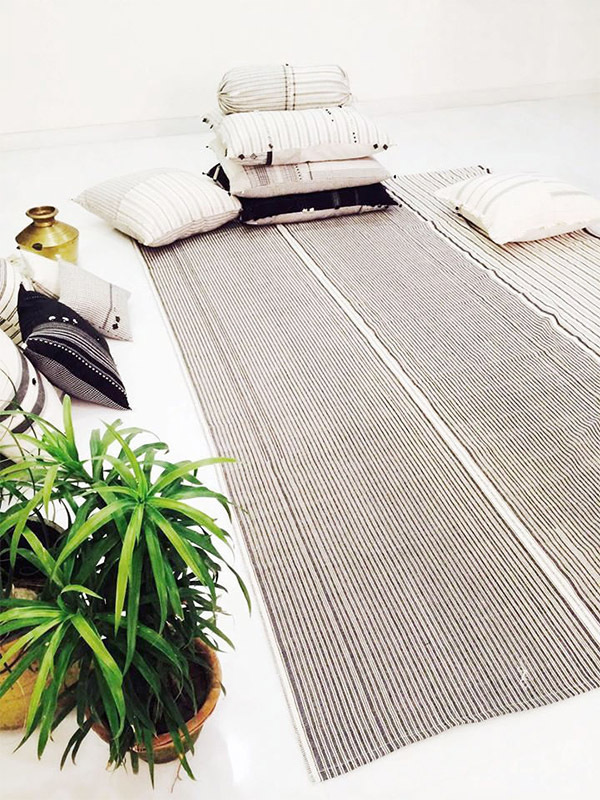 Injiri’s new collection ‘Recycle’ (below) has a traditional North Indian essence with a modern spin. The Recycle collection is created with leftover fabrics from weavers’ workshops throughout Gujurat and Rajasthan. 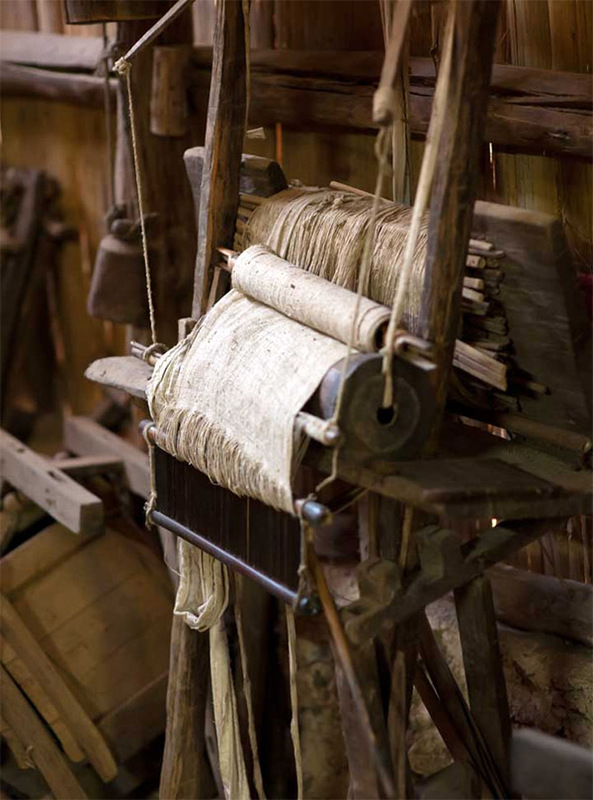 Threads of cotton are first dyed into different shades of indigo blue, then tufted by hand and sewn into pillows and rugs. The rough and shaggy texture of this collection brings a down-to-earth feel, delightfully refreshing and free-spirited. 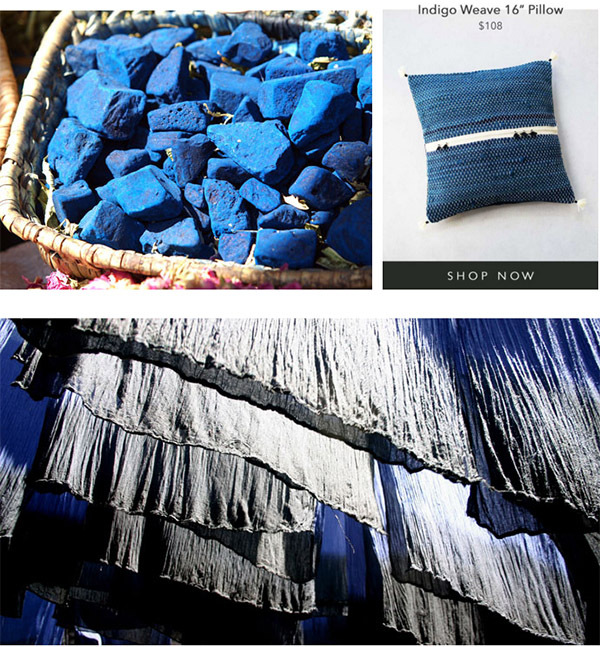 Injiri Pillow from new collection “Recyle” by Chinar Farooqui, dyed in varying shades of indigo. Jacquin: You’ve mentioned that you also take inspiration from other folk cultures outside of India? Which other cultures have you looked to for inspiration? Chinar: I often look to traditional work clothes from Europe for inspiration. There is a museum in Birgimghan where I spent many days studying traditional European smocks. I think that was a big influence on the way I looked at the traditional clothing world. Although it’s a different inspiration than provided with Indian dress, there is still a common thread that links the way folk costumes have been cut and sewn and its usage globally. Jacquin: What would a perfect day be like for you? Chinar: Textile and garment design are close to my heart, so it’s important that I spend time creating. A perfect day is on in which I have achieved enough in terms of my creative work. Since my work involves many other aspects of business, I do have days in which I do not find enough time to do creative things – and therefore I really have to strike the right balance. Shop Chinar Farooqui’s new Injiri collections ‘Ahir’ and ‘Recycle’ through Minzuu, an excellent globally inspired boutique. Also, learn more about Minzuu and their unique global model in my recent interview and home tour with founder Yilan Song. Have a lovely weekend!